The first random orbital sander (also known as a dual-action sander) was developed by Italian manufacturer Rupes in 1968, with the design progressing to mainstream production in the early 1990s. They have become extremely popular due to their ability to sand as aggressively as a belt sander whilst producing a smoother finish than an orbital sander. This makes them extremely versatile and the recommended option when looking for one sander to complete a majority of projects. These tools are known as ‘random orbital’ sanders because of the eccentric oscillating orbital sanding action they produce. When the sander is turned on the sanding disc spins but at the same time also moves in an elliptical fashion (this is the dual sanding action), ensuring no single part of the abrasive material travels the same path twice. This means the tool does not leave scratches or swirl marks, and is not sensitive to the direction of wood grain. The elliptical motion is a result of the sanding disc being offset from the motor drive. The distance between the motor drive and the centre of the disc is commonly known as the ‘diameter of orbit’ or the ‘oscillation diameter.’ Generally this is only a few millimetres. With a large range of speeds and sandpaper grits to choose from, these sanders are almost guaranteed capable of bringing a material/surface to any desired finish. The sanding pad also has a degree of flex, making these sanders ideal for sanding either flat or slightly curved materials such as curved furniture or car body work. The materials they are designed to sand comprise wood, plastic, metal, paint and filler, varnish, stone, ceramics, glass and automotive paint. Random orbital sanders are categorised by the diameter of their sanding plates and the size of the sanding disc they fit. The two most common sizes are 125mm (compact) and 150mm (heavy-duty). Random orbital sanders feature many different components, and having a sound understanding of these plays an important part in the purchasing process and finding the best random orbital sander for you. Knowledge of these parts also aids in the efficient and effective use of the tool. The power source is the component that provides the tool with electricity. On random orbital sanders, this is done through a wired connection to a mains power supply. In Australia, random orbital sanders operate off mains power (240V) through a 10A socket. The longer the tool’s electrical power lead the better. Random orbital sanders are also available for use with a compressor, meaning they are powered by compressed air. These versions are particularly suited to automotive and industrial works in a workshop/factory where there is an easily accessible compressed air supply nearby. Cordless random orbital sanders that are powered by a battery and a charger are also available and bear very similar features to those described below. They are generally not as powerful as their corded equivalents and require regular charging, but feature unmatched portability. The switch allows the electricity from the power source to flow through the tool. A random orbital sander is activated by either a rocker switch or a trigger switch. The typical switch found on lighter-duty random orbital sanders is a rocker switch. This switch extends through either side of the sander’s housing. The tool is off in the neutral middle position, and if pushed either side of this it will proceed to turn on. Heavy-duty units with an extended handle will have either a trigger switch or a sliding switch. A trigger switch will activate the tool when depressed, whilst a sliding switch locks the sander on until it is released by pushing the rear of the switch. The lock-on button is only found on random orbital sanders with a trigger switch. On these models, the lock-on button is located next to the trigger on the sander’s handle and can be pushed while the trigger is depressed to lock the tool on. To cease this function, simply pull the trigger. Make sure this button has been released prior to disconnecting the tool. If not, the tool will begin to operate upon reconnection and may result in injury. The same goes for models with sliding switches. For more safety recommendations, click here. Motors are the main component of all power tools, and are the component that converts the electricity into motion. The power that motors produce is measured in Watts. Motors used in random orbital sanders sanders are called AC motors (they are also known as universal or series motors). They will generally have an input power of between 200W and 750W, and weigh between 1kg and 3kg. Also known as a gearbox, a transmission dictates the speeds that a random orbital sander is capable of operating at. These speeds are usually between a minimum of 1,600opm (oscillations per minute) and a maximum of 26,000opm, but vary depending on the model. The larger the range of these values the greater the sander’s capabilities. The random orbital sander can be set at any point between these two speeds by the speed control dial. The speed control dial is typically a small numbered thumbwheel on the random orbital sander that allows users to preset a stroke rate (i.e. speed), and gain more control over the tool. A lower number indicates a lower stroke rate and higher number indicates a higher stroke rate. This setting should be the main variable adjusted on random orbital sanders as the user application changes. The required stroke rate does depend on the material and the working conditions and can be determined through practical testing. After longer periods of working at a low stroke rate, allow the machine to cool down by running it for approximately 3 minutes at its maximum stroke rate with no load. Typically, random orbital sanders will have plastic clamshell housings where the housing is manufactured in two halves and screwed together. As this is essentially consistent across all random orbital sanders this fails to be a valid point of comparison. The only random orbital sanders that have a traditional handle are those with a trigger switch and sliding switch. These designs allow a great deal of control over applications but are usually only found on larger, more powerful units. This handle is therefore where the dominant hand is placed and the other hand rests on the top of the machine itself. For the majority of random orbital sanders though there is no discernible handle to speak of to give you greater versatility depending on your application. On these models, your hand is designed to grasp the top of the sander around a formed ridge in the housing. Alternatively, you can also slide your hand around the diameter of the sander in any direction. The sanding plate is the component of the random orbital sander that the sanding discs are fitted to and that exhibits the oscillating motion that enables sanding. It is effectively a rubber pad with 6 or 8 holes in it fixed to the underside of the sander. Sanding discs are fitted to the sanding plate either via peel-and-stick PSA (pressure sensitive adhesive) or through a hook-and-loop system (more commonly known as Velcro®). The most common on portable electric random orbital sanders is the hook-and-loop system, and there is great number of different and cost-efficient sanding discs to choose from with this system. Hook-and-loop sanding plates are designed as a consumable component and over the life of the sander will likely need replacing. This is because the hook-and-loops on the plate wear over time and they no longer adequately grip the sanding discs, leading them to either fall off or fly off (depending or if the sander is off or on). Replacement is fairly straightforward – simply obtain the correct model plate for your sander, remove the fixing screws, swap the plates (ensuring the toothing of the drive element engages int the openings of the sanding plate) and replace the screws. The softer plates are suitable for polishing and sensitive sanding including the sanding of curved surfaces, whilst harder plates are used on flat surfaces for a higher sanding capacity. All sanders are supplied with a universal sanding plate and are capable of sanding all mainstream applications. All random orbital sanders feature a dust extraction port for connection to either a dust bag/dust canister or vacuum cleaner/dust extraction unit. Dust is extracted from the machine through the holes in the sanding plate (and the corresponding holes on sanding discs) by the internal impeller fan and then directed into the dust extraction port. Accessories for random orbital sanders mainly comprise sanding discs, but also include abrasive fibre pads and polishing bonnets. Determining the suitability of a sanding disc for your random orbital sander requires the correct satisfaction of two criteria – the sanding disc’s diameter and the number of holes in it. Ensuring the holes match up from sandpaper to sander simply allows your sander’s built-in dust extraction feature to operate efficiently (and at all). Once you’ve managed to match these up, it is then simply a matter of choosing what grade you need for the chosen application. The following table outlines the generally recommended grades of sandpaper to be used for different applications. The use of different grades outside these recommendations may be applicable depending on your application. Abrasive fibre pads fix to random orbital sanders via hook-and-look and can be used for a number of applications. These applications include the cleaning, buffing, burnishing and scrubbing and stripping of wood and metal. Some manufacturers denote the pads by their purpose – others by their grade. All have will have their diameter labelled for easy matching to your size sander. Lambswool polishing bonnets are used for the polishing of cars, boats, motorbikes and the like, and have a hook-and-loop fixing point of nominal sizes for random orbital sanders. They need to be used carefully on a very slow speed as they can easily heat up and damage paintwork. When purchasing the best random orbital sander for you, decide what features are most important to you (from the specifications above) and make sure these are included in your final purchase. The main considerations you should make include the sanding disc diameter, the oscillating speeds, the availability and cost of sanding discs and how frequently and to what degree it will be used. For the best combination of weight, power and versatility, a 125mm random orbital sander is hard to go past and quite possibly the most popular sander among consumers. For greatest control when sanding seek a model with sizeable, well positioned handles. The best random orbital sanders have high quality sanding plates that have a very fine hook-and-loop system – these will hold sanding discs a lot more securely than those with large hook-and-loops. Finally, select a model with a good quality dust collection system. Random orbital sanders can cost anywhere from $30 to $700. To browse manufacturers of random orbital sanders, please select a company from our list of power tool manufacturers. 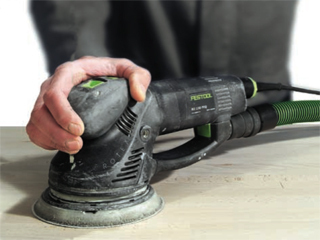 The following tips will help to preserve the life of your random orbital sander and its sanding discs, increase your efficiency, and most importantly, keep you safe. They will also help to give you the best finish possible. During use, the sanding disc will clog – particularly with paint and glue. Once clogged, it will quickly overheat. It is therefore important to change the disc before it becomes clogged.